Metro Interim CEO Stephanie Wiggins urges congress to Stand Up 4 Transportation at this morning’s rally in downtown Los Angeles. Photo: Joe Linton/Streetsblog L.A.
As today’s Streetsblog USA post related, transit supporters across the U.S. are hosting events today to “Stand Up 4 Transportation.” Metro hosted its rally this morning at Patasaouras Plaza at L.A. Union Station. The event featured Los Angeles Congressional representatives Judy Chu and Maxine Waters, and a host of L.A.’s labor, business, and transportation leaders, all calling on congress to renew investment in transportation infrastructure. Transit riders have a lot to lose if partisan battles in Washington do not find their way to reauthorizing a federal transportation bill. With the gas tax providing a shrinking portion of overall transportation funding, there are lots of stopgap ideas floating around to address the immediate shortfall. If Congress presses forward with “devolution” – basically eliminating the federal gas tax and having states go their own way – Metro transit construction and operations would face an uncertain future. 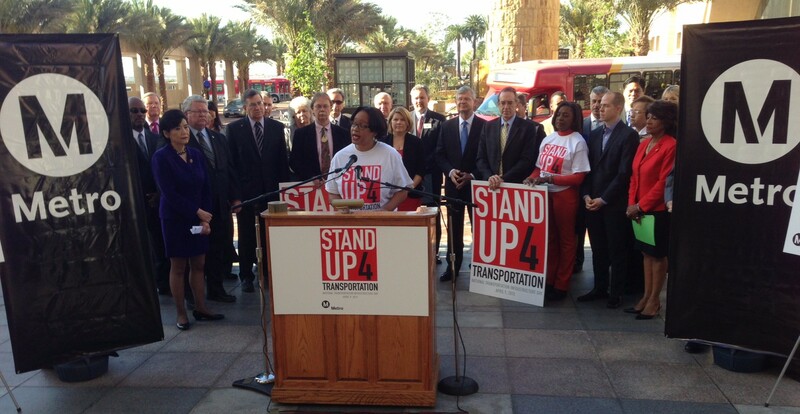 Stand Up 4 Transportation is the brainchild of the American Public Transit Association (APTA). See APTA’s coverage showing the extent of the national campaign. Follow the full congressional reauthorization drama at Streetsblog USA. Metro and Transportation Committee meetings, BKOB, Santa Monica parks, films, Bike the Vote, and much more. Election day, Baldwin Hills Crenshaw Plaza, LURN conference, Legacies of the Street, bike rides, and more!